The Logging facility allows a record to be maintained of important events that occur on Couchbase Server. By default, on Linux systems, log files are saved to /opt/couchbase/var/lib/couchbase/logs; on MacOS, to /Users/username/Library/Application Support/Couchbase/var/lib/couchbase/logs; and on Windows, to C:\Program Files\Couchbase\Server\var\lib\couchbase\logs. Additionally, explicit logging can be performed by the user. This allows comprehensive and fully updated information to be generated as required. The output includes everything currently on disk, together with additional data that is gathered in real time. Explicit logging can either be performed for all nodes in the cluster, or for one or more individual nodes. The results are saved as zip files: each zip file contains the log-data generated for an individual node. Explicit logging can be performed by means of the Couchbase CLI utility cbcollect_info. The documentation for this utility, provided here, includes a complete list of the log files that can be created, and a description of the contents of each. Explicit logging can also be performed by means of Couchbase Web Console: on the Logs page, left-click on the Collect Information tab, located near the top. This allows logs and diagnostic information to be collected either from all or from selected nodes within the cluster. It also allows a Log Redaction Level to be specified (this is described in Applying Redaction, below). The Specify custom temp directory checkbox can be checked to specify the absolute pathname of a directory into which data is temporarily saved, during the collection process. The Specify custom destination directory can be checked to specify the absolute pathname of a directory into which the competed zip files are saved. The Upload to Couchbase checkbox is described in Uploading Log Files, below. As this indicates, a set of log files has been created for each node in the cluster. Each file is saved as a zip file in the stated temporary location. Log files can be uploaded to Couchbase, for inspection by Couchbase Support. The dialog now features an Upload to Host field, which contains the server-location to which the customer-data is uploaded. Fields are also provided for Customer Name (required) and Ticket Number (optional). The Upload Proxy field optionally takes the hostname of a remote system, which contains the directory specified by the pathname. Left-click on the Start Collection button. When collection is complete, a notification provides the URL of the uploaded zip file. Note that redaction may eliminate some parameters containing non-private data, as well as all parameters containing private. Logged issues will be found harder to diagnose, by both the user and Couchbase Support. Log-collection is significantly more time-consumptive, since redaction is performed at collection-time. Redaction of log files saved on the cluster can be applied as required, when performing explicit logging, by means of either cbcollect_info or the Logs facility of Couchbase Web Console. For information on performing explicit logging with redaction at the command-prompt, see cbcollect_info. Left-click on the Start Collection button. A notification explains that the collection-process is now running. When the process has completed, a further notification appears, specifying the location (local or remote) of each created zip file. Note that, when redaction has been specified, two zip files are provided for each node: one file containing redacted data, the other unredacted data. Certain Couchbase technologies — such as cbbackupmgr, the SDK, connectors, and Mobile — create log files saved outside the Couchbase Cluster. These can be redacted by means of the command-line tool cblogredaction. Multiple log files can be specified simultaneously. Each file must be specified as plain text. Optionally, the salt to be used in encryption can be automatically generated. For more information, see the corresponding man page, or run the command with the --h (help) option. Couchbase Server creates log files in the following locations. The following table lists the log files to be found on Couchbase Server. Security audit log for administrators. Troubleshooting log for the babysitter process which is responsible for spawning all Couchbase Server processes and respawning them where necessary. Used to pass service crash reports from the babysitter to the ns_server. For example, if the ns_server is available, any crash of the babysitter’s child is passed directly to the special crash logger service within the ns_server. If the logger service is not attached to the babysiter, then the babysitter saves that crash report to the disk and the ns_server can later obtain and log it even if the babysitter is restarted. This is not a log file in itself. Debug-level troubleshooting for the cluster management component. Error-level troubleshooting log for the cluster management component. Troubleshooting logs for the full-text search service. Troubleshooting log for the Cross Data Center Replication (XDCR) component used in Couchbase Server versions after 4.0. The admin access log records server requests (including administrator logins) to the REST API or Couchbase Server web console. It is output in common log format and contains several important fields such as remote client IP, timestamp, GET/POST request and resource requested, HTTP status code, and so on. The admin access log records internal server requests (including administrator logins) to the REST API or Couchbase Server web console. It is output in common log format and contains several important fields such as remote client IP, timestamp, GET/POST request and resource requested, HTTP status code, and so on. Troubleshooting log for the indexing and storage subsystem. Info-level troubleshooting log for the cluster management component. Contains information relating to the core memcached component, including DCP stream requests and slow operations. Troubleshooting log for the metakv store, a cluster-wide metadata store. Contains information related to starting up the CouchDB subsystem. Troubleshooting log for the projector process which is responsible for sending appropriate mutations from Data nodes to Index nodes. Contains progress and crash reports for the Erlang processes. Due to the nature of Erlang, processes crash and restart upon an error. Troubleshooting log for the ssl proxy spawned by the cluster manager. Contains periodic statistic dumps from the cluster management component. Troubleshooting log for the view engine, predominantly focusing on the changing of partition states. Troubleshooting log for the Cross Data Center Replication (XDCR) component used in Couchbase Server versions prior to 4.0. Error-level troubleshooting log for the Cross Data Center Replication (XDCR) component used in Couchbase Server versions prior to 4.0. Trace-level troubleshooting log for the Cross Data Center Replication (XDCR) component used in Couchbase Server versions prior to 4.0. Unless trace-level logging is explicitly turned on this log is empty. This rotates the debug.log at 10MB, and keeps ten copies of the log: the current log and nine compressed logs. The default log location on Linux systems is /opt/couchbase/var/lib/couchbase/logs. The location can be changed. Note, however, that this is not advised; and that only the default log location is supported by Couchbase. Log in as root or sudo and navigate to the directory where Couchbase Server is installed. For example: /opt/couchbase/etc/couchbase/static_config. 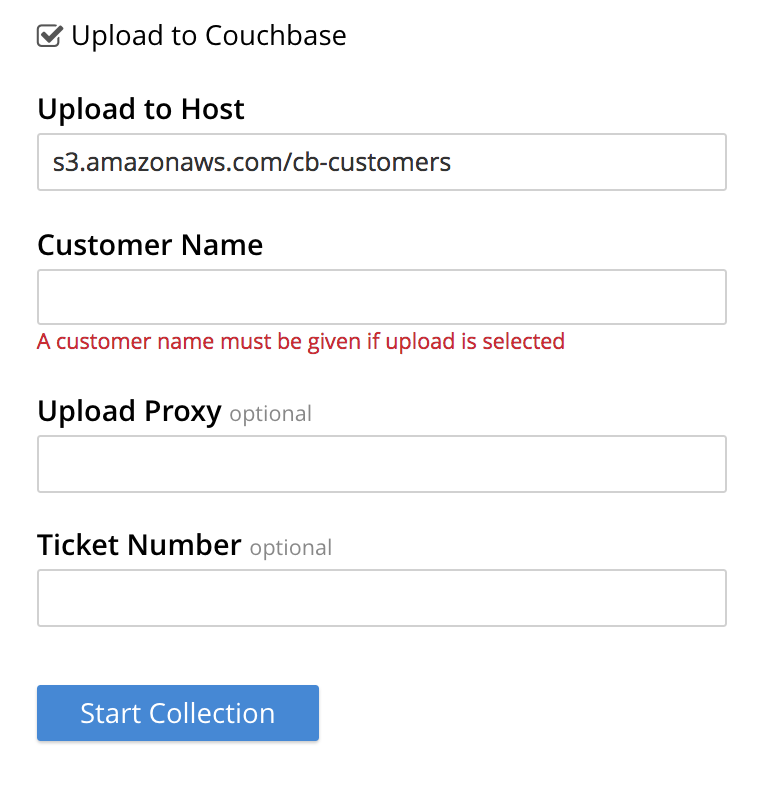 Stop and restart Couchbase Server. See Startup and Shutdown. The default logging level for all log files is debug, except for couchdb, which is set to info. The logging levels can be changed. Note, however, that this is not advised; and that only the default logging levels are supported by Couchbase. Either persistent or dynamic changes can be made to logging levels. Log in as root or sudo, and navigate to the directory where you installed Couchbase. For example: /opt/couchbase/etc/couchbase/static_config. log_component: The default log level (except couchdb) is debug; for example ns_server. The available loggers are ns_server, couchdb, user, Menelaus, ns_doctor, stats, rebalance, cluster, views, mapreduce_errors , xdcr and error_logger. logging_level: The available log levels are debug, info, warn, and error. To collect logs, use the CLI command cbcollect_info. 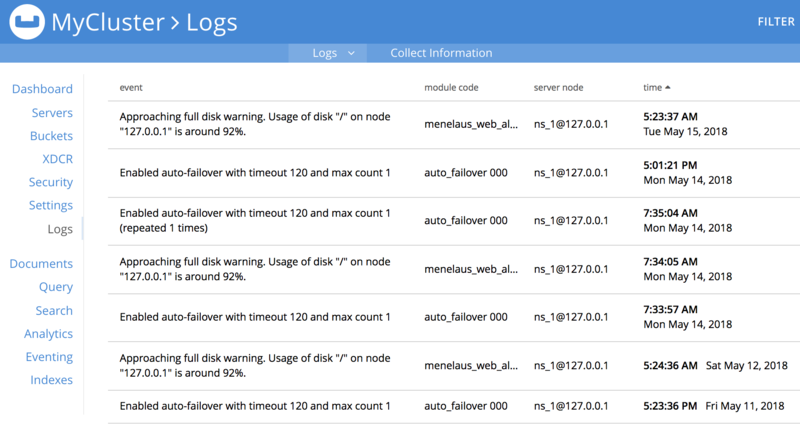 The Logs REST API provides the endpoints for retrieving log and diagnostic information. To retrieve log information use the /diag and /sasl_logs REST endpoints.